Lighthouse SWIM Diapers are a new way to enjoy the pool or the beach! One size diapers fit babies from 7-32lbs! Made with waterproof TPU and wicking jersey inner for breathability and comfort! Moves with baby, lightweight TPU feels softer than other swim diapers and allow for more movement. One-Size swim diaper fits babies 9-32 lbs. Extremely absorbent, Lighthouse Diapers can hold 12oz of liquid because of its super thirsty knit bamboo layer. No leaks, no mess. 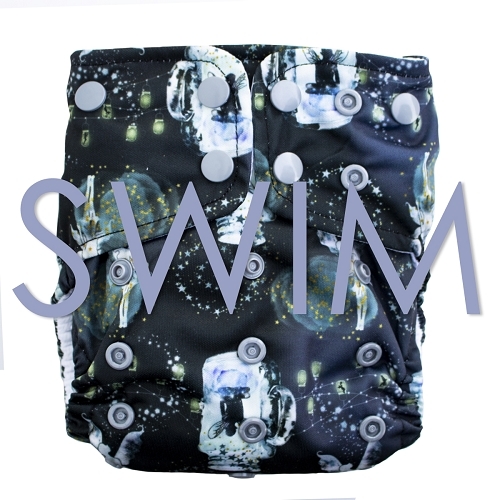 These are great as actual swim diapers, but as covers they are too small. I have had a few of these and I love them as actual swim diapers. They are very trim without an insert and require little tucking because there isn't a ton of fabric. If using these as covers the cut is very small (like their AIO) and I don't believe they'll last through potty training.